It's Anyhoosday, I mean Tuesday, and well honestly, I'm plum out of things to say. Maybe someone can help me find my brain because I think it may have ran away. No??? Not today? Ok. I guess I'll go another round of hide and seek with it. Sporting my thrifted finds here. If you don't know by now, I really love to find items that are symbolic (like butterflies) or represent me in some way. Hence this gold lion necklace. Astrologically speaking, I am a leo, and I have always felt a strong affinity towards my sign. Thank heavens it didn't change when the stars shifted. Astro-identity crisis aborted. Phew. Naturally, I purred when I found this necklace. It's just a little piece of leo fierceness around my neck. On a completely random, and I mean most random note ever, if only I could somehow mix butterflies and lions together to create the perfect specimen. Hmmm...I would call it 'Lionfly'. ha! lionfly.. i love it :) annnd your outfit is pretty cute too. v retro lookin! xoxo jcd:: enter to win my jewelry giveaway !! I had a mind-loss day not too long ago. It will come back, pinky promise. In the mean time just keep taking gorgeous photos and rockin your beautiful thrifty finds! Can I just steal your style? Thank you SO much for letting us know where you get what you are wearing. Your blog is a definite must read! you are so glamorous looking I cant even take it! Love your outfit!! Love that shirt! Gorgeous as always! hahahah wow you really drew it! I love the thought process behind this! and you look like a chic little 70s lady in that outfit! Girl you were born to wear flared jeans, have great long legs! Lyonflies are the coolest animal ever, love the sketch! Speaking of things I love, let's add your blouse and hair to that list. Oh and your apparently gorgeous weather. Yep, all on the list. beautiful photos and outfit ! The sunshine you're currently basking in has filled me with jealousy and longing. Enjoy it -- you look like the embodiment of springtime! 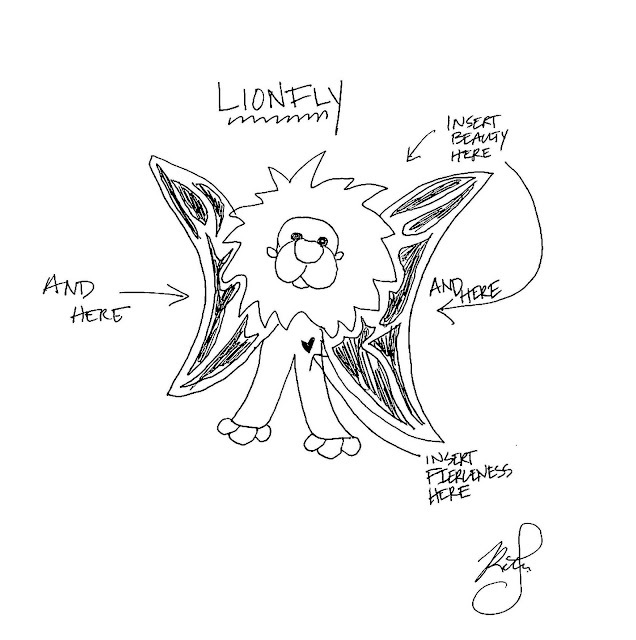 haha i love lion fly!!! and i love that adorable shirt and the clutch! Haha this made me laugh a lot. The weather looks so nice. Gorgeous top. Besides your style that amazes me!You are totally 70s! you are absolutely stunning! i just love the outfit ... i want those jeans!!! You look beautiful! I love your outfit. Those jeans are amazing! what planet is that amazing thrift store from? perhaps the same one your lionfly came from? that shirt and clutch are seriously killer. what a great find! and this post is hilarious. happy tuesday! your body looks uh-mazing in that third photo. and i say that as someone who worked in the industry. not a creeper. ok im kind of a blog creeper. but u know what im sayin. what an adorable sketch!! i love it. and the pictures from today are so amazing. i love the sunlight coming in from the side. and these jeans make your legs look even longer! What a kah-wink-ee-dink! I'm a leo too! AND my sign didn't change either! Thank goodness cause I prolly would have cried and THEN kept being a leo anyway! That outfit is so cute! I'm a leo too and I'm SOOO Glad my sign didn't change! Great outfit! I love this look :) You are so cute! Love everything about your otfit and photos! You look gorgeous! Just happened upon your blog and I must say I really love your style! Doesn't hurt that you are gorgeous! hahah, oh my gosh, i love your little lionfly sketch! so cute! I absolutley love your hair!! Hahaha! Great post, outfit and drawing! I definitely have those days too! XOXO, www.NatalyasCloset.com! Haha, that is so cute! Lionfly. Love your thrifty finds here. The sunshine is so beautiful, too! SHUSH UP!!!!! My b-day is the 13th too!!! I was born in 82 so I was born on Friday the 13th!!! How crazy!